The look of singer Kim Won Jun starring in KBS2 weekend drama series My Husband Got a Family (aka You Who Rolled In Unexpectedly) was made public for the first time. 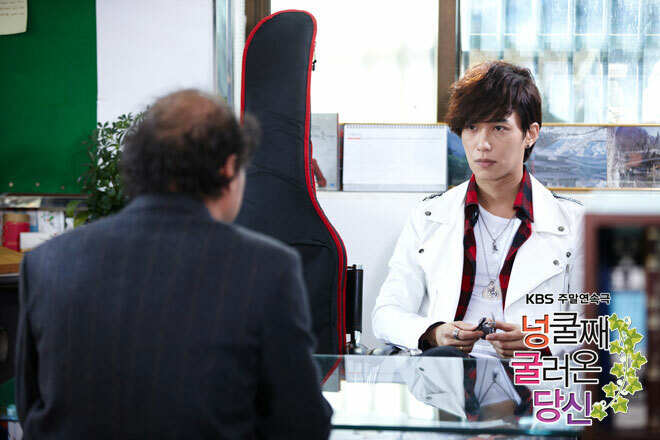 Kim Won Joon will play the popular singer Yoon Bin who is shining at the 90s through episode 6 of My Husband Got a Family broadcast on March 11th, 2012. He is expected to demonstrate to the audience the all-inclusive personality that is natural and unrestrained, handsome and humorous. In the drama, Yoon Bin is the famous “predecessor of brother Bin” kind of character similar to Won Bin and Hyun Bin. However, due to large overhead and live beyond income, he is reduced to having to move to live in the rooftop room of Uhm Chung Ae (Yoon Yeo Jng). There, Yoon Bin meets the fan during his childhood, the eldest daughter of owner of rooftop room, Bang Il Sook (Yang Jung Ah), and starts a “love line under the same roof” that is quarrelsome. Kim Won Jun will debut in episode 6 when looking for an apartment at real estate agency of Bang Jung Bae (Kim Sang Ho). His artist extravagance look of carrying a guitar on his back is expected to seize the audience's attention. However, the sense of humors and incomprehensible actions hidden under a beautiful appearance wll also move the drama to a high-profile atmosphere. Kim Won Joon's first filming was done on February 27th, 2012 at Songpa-dong where the villa is located. It's his return to acting after parting with the small screen for two years. His acting that is without hesitation is shining at the shooting scene. After practicing for a few times with senior Kim Sang Ho, Kim Won Jun perfectly interpreted the role in the drama during filming, winning the praise of "because of the debut Kim Won Jun, new charm is injected" from Kim Sang Ho. In order to take off the sunglasses coolly, it is inevitable to encounter a few times of NG. When NG, he would use his unique good-natured smile and coquetry to get pass the embarrassment, making the shooting scene filled with laughter. In particular, even if shooting in the early morning, he also did not reveal an expression of exhaustion, instead was shooting diligently, making the atmosphere of the scene harmonious. Kim Won Jung met Yang Jung Ah for the first time in 1993 when he was a radio DJ. After 19 years, they meet again through the drama. What kind of love line they will compose has increased the expectation of the audience. An official related to the drama said, "He did not neglect in his first shooting because of been just a supporting actor, perfect interpreted the role of Yoon Bin. The "coquetry and hypocritical" that required by the role has made the shooting scene continuously burst into laughter. His pleasant smile and warm touch made the drama as if blowing a fresh wind."